Brief Description of Subject: The window depicts the appearance of Our Lady to a young and uneducated French girl named Bernadette outside the town of Lourdes in France in 1858. 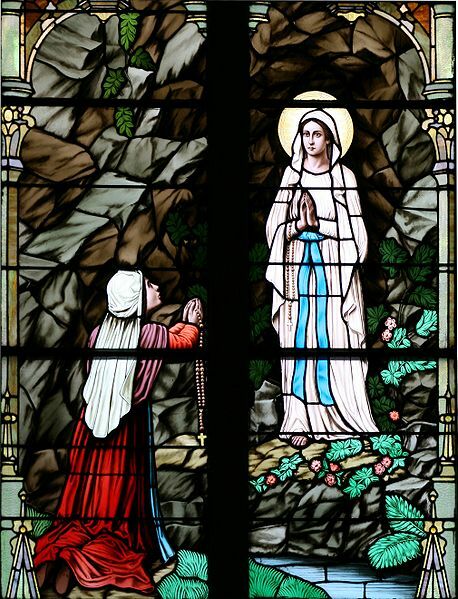 The Blessed Mother appeared in a grotto eighteen times to Bernadette. During one of her visits, Mary instructed Bernadette to scratch the ground in the grotto. When Bernadette dug in the ground she discovered a spring of water which formed a pool. Mary also asked Bernadette to tell the parish priest and the bishop to build a small chapel at the grotto and tell of her appearance.